While swimming free in the ocean, a young dolphin becomes caught in a trap and severely damages her tail. Though she is rescued and transported to the Clearwater Marine Hospital, her tail cannot be saved, and her prognosis is dire. What the dolphin, now named Winter, needs is a miracle. She gets that miracle in the form of a marine biologist (Harry Connick Jr.), a prosthetics designer (Morgan Freeman), and a devoted boy (Nathan Gamble), who find a way to help Winter swim again. 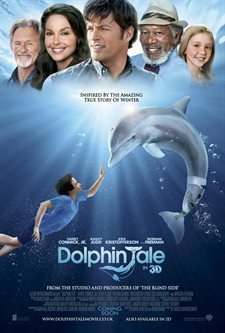 Download Dolphin Tale in Digital HD from the iTunes store. Dolphin Tale images are © Warner Bros.. All Rights Reserved. The Inspiring, moving, poignant true story Dolphin Tale splashes into theaters this weekend with a family friendly theme that's sure to touch your heart. Filmed in Florida where it happened it's a movie about a dolphin that receives a compassionate helping hand and a strange new lease on life. Riding his bike to summer school Sawyer (Nathan Gamble) comes across a horrible sight, a beached dolphin tangled in ropes and attached to a crab trap. Using a tender hand and his pocketknife he frees the dolphin from most of the bonds that are strangling it. Rushing to his aid Dr. Clay Haskett (Harry Connick, Jr.) takes the mammal to the Clearwater Marine Hospital where he finds that its tail has to be removed to save its life. 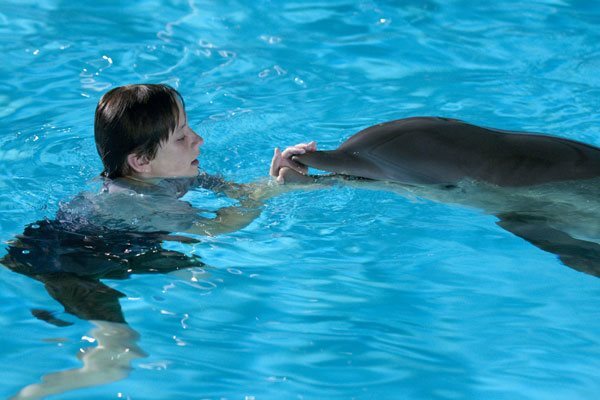 Sawyer and Haskett's young daughter Hazel (Cozi Zuehlsdorff) become emotionally attached to the aquatic animal. When Sawyer stumbles upon prosthetics doctor Cameron McCarthy (Morgan Freeman), he comes forward with a plan. The acting here is quite good. Newcomer Zuehlsdorff puts on a very good comical show as the daughter of Dr. Haskett with her continuous jabber about her knowledge of the Marine Hospital and the animals it contains. She's a sweet breath of fresh air in a role that seemed to be written for her. Playing opposite her, Gamble plays it straight working hard to keep Sawyer a key role among the greats like Connick Jr. and Morgan Freeman. His role doesn't need much creative acting being a boy who saves Winter from death twice. 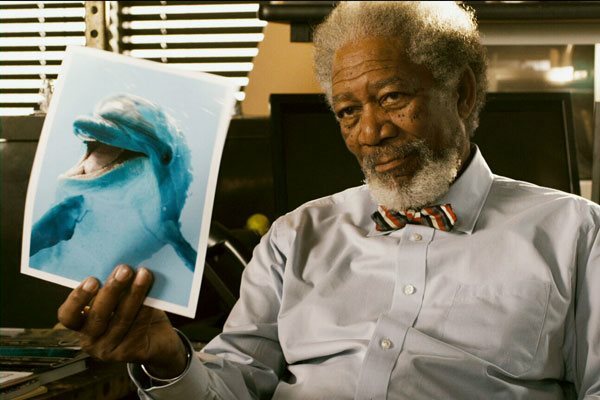 Freeman draws a walk-on character, the man who develops the prosthetic tail that saves Winter from an untimely death. There's not much to his role here, but I am glad they chose him for this family movie as he ups the cast value by a ton. Connick Jr., best known for his music, plays it safe as the animal doctor who saves Winter from dieing from a gangrene type injury and bringing to light that all mammals are important. His character needed a smooth easygoing kind of actor and Connick Jr. fits perfect. Keeping the cast from running amuck with their own style, Smith puts on one of the best animal inspirational family films I've seen in a decade. He works his audience with an emotional story putting his characters in a difficult position of possibly having Winter put to death with only blind luck saving the day. He depicts Florida's seaside much like the days of old when the television show Flipper made northerners want to move to the state and live the good life. Dolphin Tale is rated PG for mild thematic elements. The film is perfect for families and offers good values for the youngsters. Theaters are showing the film in the 3D and 2D format, both are excellent values. FINAL ANALYSIS: A kid friendly film that they can flip over. 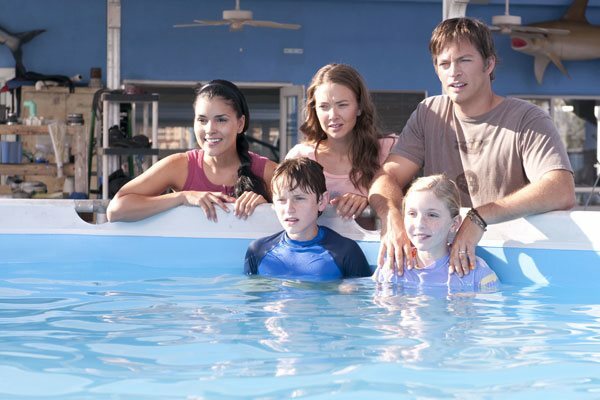 Dolphin Tale images © Warner Bros.. All Rights Reserved.